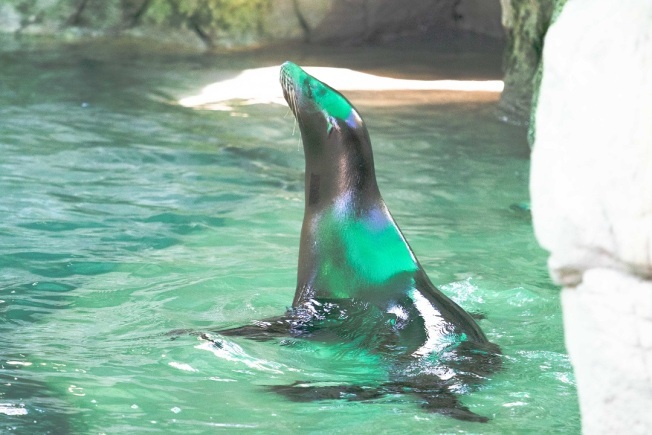 "Not every facility wants to take in sea lions with visual issues, but Audubon literally saved their lives by accepting them"
A pair of visually impaired 2-year-old sea lions has joined the four sea lions already at the zoo. Zoo officials say in a news release that Ayah and Jolee were both malnourished when rescued along different parts of the California coast in June 2017. A pair of visually impaired 2-year-old sea lions has joined the four sea lions already at the zoo in New Orleans. Jolee has cataracts in both eyes, and had an injury in her left eye when she was found on an El Segundo jetty. She gets around by following Ayah, who lost her left eye to a small-caliber bullet found in her brain after she came to Audubon. Ayah was found off the Malibu coast. The bullet didn't cause any brain damage, Audubon said. They're now swimming with 31-year-old Lillli and three 6-year-olds: male Huey and females Zoey and Roux. Both youngsters were nursed back to health at the Marine Mammal Care Center Los Angeles. "Not every facility wants to take in sea lions with visual issues, but Audubon literally saved their lives by accepting them," said the center's staff veterinarian, Lauren Palmer. "For me, these two animals are all about resilience. New Orleans is a perfect home for them." The Audubon staff named the pair. Ayah means "miracle" in Arabic, and Jolee sounds like the French word for "beautiful." "They are already amazing ambassadors for their species and we hope their stories will inspire our guests to be more aware of how humans impact our fragile oceans and what we all can do to help," said Audubon's sea lion curator, Courtney Eparvier.